No birthing experience is exactly alike, and so I had no idea what to expect about our second child’s delivery. I was a little nervous, a little excited, and had no idea what to expect. 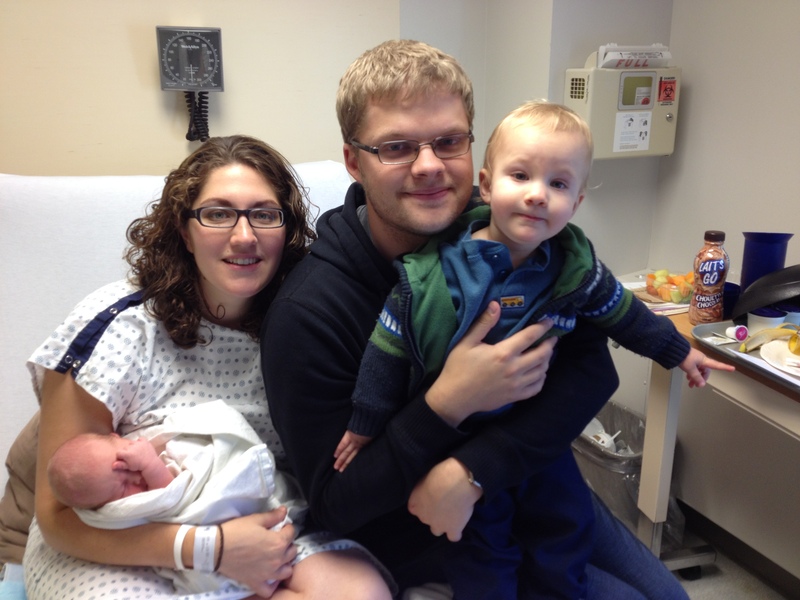 I recounted Calvin’s birth story here, and now I will share Victor’s story. Monday, October 21 was my due date. I was not surprised I was still a mother of just one that day. I was measuring small, and Calvin was way over due. At my doctor’s appointment the previous week, I was 2 cm dilated, and had a membrane sweep done. Nothing happened after that. My next appointment was on Wednesday, October 23. I was measured at 5cm and had another sweep done. My doctor was very optimistic about me going into labour that evening. I don’t know how much of that was medical based and how much it was because she was on call at the hospital that night and just being optimistic. So she prescribed me a brisk walk that afternoon, and playing with Calvin on my hands and knees. I also bounced on the exercise ball to try and get things happening. At this point I had to figure out what to do with Calvin. Thursday was the only day that my main 2 babysitters were unavailable, and my mom wasn’t sure at that point when she would be coming. So I had a fairly complicated schedule of plans A through D worked out, depending on when my mom came, and if/when I would actually go into labour, who would watch Calvin and stuff. The end result was that my mom flew in Wednesday evening, so I didn’t have to rely on anybody else. We got to use the easiest plan! All through that evening I felt cramps coming on, like menstrual cramps. They didn’t hurt, but they were there. They were fairly strong and consistent while I was nursing Calvin before his bedtime around 8 pm, coming every 2 minutes or so, but slowed down when I was done. I was hoping that the nursing would help them stay coming stronger and faster, but that didn’t happen. Throughout the rest of the evening I felt them every 8-12 minutes, and they weren’t hurting. My mom arrived at our place from her flight just before midnight. At that point, I was starting to be in a little bit more pain, but they were still far apart. We went to bed. Tim fell asleep, but I didn’t. Gradually I could feel the cramps getting closer together and stronger. My doctor had instructed me to head to the hospital as soon as I felt like contractions were starting, but I had no clue what the difference was between cramps and contractions. so I decided that point was when I no longer could lay still during one. That ended up being at 2am. I woke Tim up and we made the 5 minute trek to the hospital. When we got there I was brought to the observation area where they monitored me and the baby for a bit. They measured me at being still at 6cm. Then about half an hour later I was brought to my labour and delivery room. I spent the next little bit sitting on the ball, and riding out the contractions. At this point they were strong enough that I had to breathe through them, but they were quite manageable. It didn’t seem like much was progressing, so I asked if my doctor could break my water. I was 8cm so she came by around 4 am to do that. The passage of time is a bit hazy at this point, but I could immediately tell the contractions got worse right after. During those contractions I took the gas and Tim was continuing to massage my lower back with each contraction while I was on my hands and knees on the bed. I could feel the pain slipping away each time he reached whatever particular spot helped for each individual contraction. It felt like only a few contractions after my water broke that I felt the need to push. I flipped over onto my back, the bottom of the bed was taken apart and the stirrups were put in place. Going into it, I was apprehensive about delivering on my back, but my doctor assured me that it was the best way for her to control the head and prevent a lot of tearing. Since I was more apprehensive about tearing, I was okay with delivering on my back. The big difference I found between that and having a crouching delivery is that I had to focus energy on two places this time. They wanted me to grab behind my legs and pull up while at the same time pushing. I heard myself say, “I can’t!” because I didn’t have the energy to do both. But somehow I managed, and after 10 minutes of pushing, Victor was here! I ended up with just a small tear, and because of my quick delivery, there was extra bleeding or something from my uterus, so I was put on an Oxytocin drip afterward for a few hours. So while I didn’t have to be attached to an IV during labour, I was for the first little bit post delivery. I can already tell a huge difference between this time and last time with regards to recovery. Maybe in part due to it being my second, and partially due to a smaller tear (and less swelling), but I feel like I have more energy, am less sore, and that I will recover a lot quicker in general. Plus, I can sit on our kitchen chairs! Another difference from last time was that I obviously was not induced. The difference I think this made was that my initial crampy, “pre-labour” was a lot longer this time, but my active labour was shorter. That is definitely not something to complain about! After Victor was born, we made calls, sent texts and were brought to my room. I wasn’t sure how long they wanted me to stay, but I wanted out that day. A couple people mentioned maybe the next day, but I really didn’t want to spend a night there! All they needed was to make sure Victor was eating okay, that he had good output, and that my Oxytocin drip was done. So we were out of there by 3:30 in the afternoon. I’d say a 13.5 hour trip to the hospital and coming home with a baby is pretty great! First family photo of four. One day we will get a better one. It has been fun being a family of four the past couple days. Especially watching Calvin with his little brother. I wish you could all see it in person. So cute! This entry was posted in Life and tagged baby #2, pregnancy, Victor on October 26, 2013 by Larissa Sevenhuysen. Great story! It sounds like everything went well! Thanks for posting this! It makes me feel closer to the action a bit. Thank goodness for the internet! What would long-distance families do without it? Love you all! Congratulations & blessings on your new family addition of baby Victor ! !